Named after a famous French virility enhancer. Really. Let’s not beat around the bush about how this cocktail got its name. Back in the 1920s, there was a French surgeon by the name of Serge Voronoff who developed a procedure for grafting monkey testicle tissue (glands) onto the, um, “glands” of male humans. The aim was to enhance the men’s virility, bring back their lost youth, and promote longevity. This inventive procedure gained widespread notice. Everyone heard about it, including Harry MacElhone, owner of Harry’s New York Bar in Paris. So when MacElhone created this drink, circa 1923, he called it the Monkey Gland Cocktail—no doubt hoping that some of the surgery’s virile glory would rub off (so to speak). The surgery didn’t work (you’re surprised, we know). But the cocktail? It’s a transfusion of pleasure. And you don’t need a medical professional to administer it. The Monkey Gland is a bracing mixture of gin and freshly squeezed orange juice, livened up with a jolt of grenadine and a kiss of absinthe. Grenadine adds sweetness to this drink, in addition to providing a nice pink tinge. You should use real—i.e., pomegranate—grenadine, not the ersatz stuff that liquor stores usually stock. Commercial brands (such as Rose’s) offer attractive fluorescent color (and the hue is oddly compelling, I admit), but they’re made primarily from artificial flavors. You’re better off making your own Homemade Grenadine. It’s easy and takes just minutes. The original recipe for this drink specified equal measures of gin and OJ. That’s a nice ratio, but I prefer two parts gin to one part juice, so that’s what my recipe reflects. Feel free to change it as you wish. In the Notes, I offer an alternate recipe that substitutes Bénédictine for absinthe. This recipe takes a few minutes to make, and serves one. Add all ingredients (except garnish) to a cocktail shaker half-filled with ice. Shake until well chilled—about 20 seconds or so. 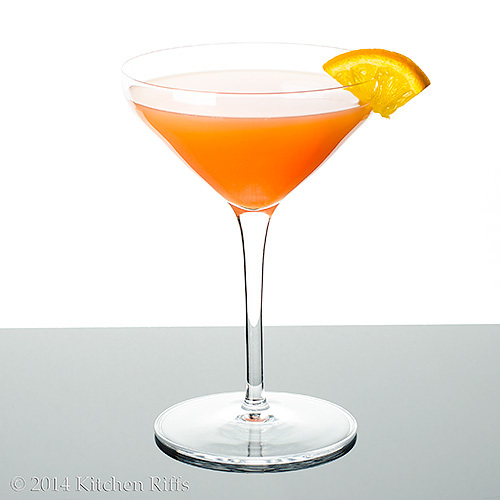 Strain into a cocktail glass, preferably chilled, and garnish with a twist or slice of orange, if desired. Serve. In addition to London dry, you might see Dutch or Belgian gin (sometimes called jenever or genever), which is made from malt rather than grain. There’s also Old Tom Gin, which has a sweeter taste. Both of these varieties are less common than London dry. Absinthe is an anise-flavored spirit. For years, it was illegal in the US and much of Europe (one of its ingredients was thought to be psychoactive and addictive). It’s now legal again—and usually quite high proof (100+). I often substitute Pernod for absinthe—mainly because it’s my favorite brand of pastis. But there are other good brands out there. If in doubt, ask the friendly sales people at your liquor store what they recommend. BTW, different brands of absinthe and pastis have different levels of sweetness, so you may need to adjust the quantity of grenadine in this drink accordingly. Because absinthe was illegal in the US (and much of the world) for decades, some bartenders started substituting Bénédictine liqueur in this cocktail. If you’d like to try that variation, just replace the absinthe with Bénédictine. 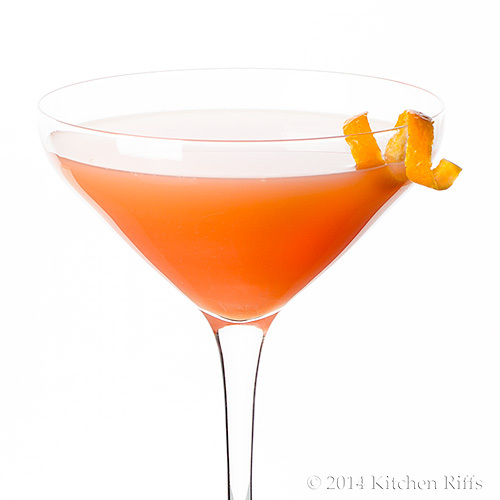 It changes the character of the cocktail a bit—but it’s a pleasant change, and one you may prefer. There are some who suggest this drink can be served on ice (on the rocks). But straight up (shaken with ice, then strained into a glass) is the way most people prefer this drink. Serge Voronoff was born in Russia, but emigrated to France as a young man. His “monkey gland” procedure was highly respected. Until it wasn’t. As medicine advanced during the 20th century, his methods came to be seen as an embarrassment—and Voronoff became an object of ridicule. But while the world believed in his surgery, he was hot stuff. He treated over 500 men in France alone, plus thousands more in clinics he set up around the world. Many of his patients were prominent men (they included the chairman of a Fortune 500 company and Mustafa Kemal Atatürk, founder of the modern Turkish republic). “It’s amazing how word of Voronoff’s, um, procedure spread so quickly way back then,” said Mrs K R.
“Yeah, they didn’t have email, so they couldn’t send out ‘male enhancement’ spam,” I said. “Maybe you should mix us another?” suggested Mrs K R.
Hi Nee, the history of this one is particularly fun. Or at least interesting. ;-) Thanks for the comment. It looks beautiful though, and bet tastes awesome. No wonder Mrs KR loves this particular cocktail and wants second helpings. John, this pun-laced post is too much fun! I've never heard of the libation, or the Voronoff procedure, but the history, humor, and alluring cocktail makes for a great read. Cheers! Well this is the most interesting back story for a cocktail that I think I have ever heard. Made we squirm a bit but memorable stories often do. Love the color of this one, and your puns. Hi Rocquie, uplifting indeed! ;-) Really interesting drink -- worth a try. Thanks for the comment. Hi Minnie, glad you enjoyed this! It was fun to write, and both Mrs KR and I contributed (some of the better lines are actually hers). Thanks for the comment. Hi Brooks, this isn't a widely known drink these days, although back in the day it was quite popular. Thanks for the comment. Hi Karen, there's definitely a cringe factor involved in reading about this drink! Fortunately the drink itself is a real pleasure. Thanks for the comment. John, that is really a funny, fun little story! Can you imagine if the surgery had been a success! Where would Viagra be today, :) At any rate, it is a great looking cocktail, have one on me! :) Thanks for sharing this fun. What a name! What a cocktail! I love the story of how it got its name, and I really enjoy your cocktail posts. Keep 'em coming. Hi Pat, ;-) Isn't this fun? The story is amazing! Thanks for the comment. Hi Adri, cocktail posts are fun to write (and photograph), so I'm glad you enjoy them. This one was a particular delight -- sooo much one can say about this drink (and not say, too, if you know what I mean). Thanks for the comment. Hahaha! The cocktail certainly sounds better than the procedure! And, it's probably much more effective. Hi Mary Frances, the procedure sounds dreadful, doesn't it? The cocktail, however, tastes really good! Thanks for the comment. Hi Denise, that story is something, isn't it? One of the reasons why I love cocktail history! Thanks for the comment. Hi Juliana, the story behind the cocktail is beyond weird. The flavor of the drink? Anything but weird! Delish, in fact. Thanks for the comment. This looks like something I would get very very drunk off of... Even if I just sniffed it! LOL! Hi Maureen, :-) This was sooo much fun to write! We cracked each other up while putting the post together. So much material to work with! Thanks for the comment. Hi GiGi, this is a pretty hefty drink, I must admit. But awfully good! Thanks for the comment. So funny that a cocktail with such a strange moniker would include a once illicit spirit, absinthe. I think that just enhances its unique appeal. Love the bright, orange color. Sounds and looks delightful. Hi Carolyn, this really is an interesting drink, isn't it? And awfully good! Thanks for the comment. Hi Daniela, isn't this a fun drink? I love its history! Thanks for the comment. Hi Kumar, the color really is sunny, isn't it? Great flavor, too. Thanks for the comment. What a gorgeous cocktail John and the story alone is worth trying out his cocktail. Just so we can share the story with friends... Haha... O and I never knew that jenever is known as Dutch gin.... See I learn something new every day! This was so fun to read and the name cracks me up!! thanks for sharing John and hope you have been doing fine, sorry I was off lately but missing everybody. What a funny name for a cocktail! Great color and lovely flavor. Hahaha - the story behind this drink is too funny! So I am curious, what happened to the 500 men he treated? I love your tidbits of history of these cocktails, John. Always fun to read your posts! I'm not a huge gin lover, but I bet I'd love this one. Thanks for sharing another great cocktail! Hi Simone, well in the US (and Great Britain, I believe) it's called Dutch gin. ;-) This really is a fun cocktail. And the story is . . . interesting. ;-) Thanks for the comment. Hi Ashley, the name -- and cocktail! -- is pretty interesting, isn't it? ;-) Thanks for the comment. Hi Helene, good to see you! And isn't this cocktail a hoot? I love it! Thanks for the comment. Hi Rosa, once you hear this cocktail's name, it's pretty hard to forget. ;-) Thanks for the comment. Hi Shashi, that homemade grenadine is really nice! As is the cocktail. The men Voronoff treated? I'm sure at first they thought something was happening. Kinda the way we all think fad diets work -- and they do for a bit because we believe, but then they don't. But after time it became pretty apparent his procedure wasn't all it was cracked up to be. Took years, though, before it was totally discredited. Thanks for the comment. Hi Bill, isn't the the history of the one so much fun? Really and truly a hoot. Thanks for the comment. What a riot! I"ve never heard of this cocktail although I haven't heard of a lot of them. But this one is truly funny how it came about. It looks so good, cold and refreshing. You always have fun drinks to share. One of these days I'm going to have to purchase some of the ingredients and whip a few up for my hubby and I to sample. Hi Vicki, this one isn't all that popular these days. Used to be huge, though! 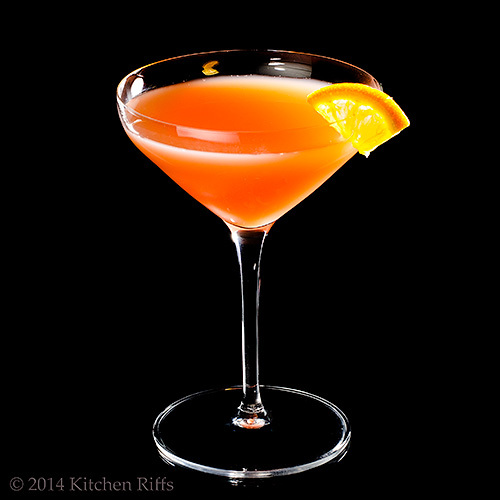 If you're just getting into cocktails, at this time of the year I'd suggest the Classic Daiquiri (http://www.kitchenriffs.com/2011/06/classic-daiquiri-cocktail.html) as a good starter cocktail. Easy to make, great flavor. Thanks for your comment. As always, beautiful pictures... and totally love the name of this drink! Hi Laura, LOL! I know what you mean. It's history is so strange. ;-) Thanks for the comment. Hi Pamela, it's a totally fun drink! Thanks for the comment. I laughed through this entire post! You have a sense of humour, Mr Riffs :) I may not drink but I'm the most knowledgable non drinker there is! I love the stories behind these cocktails, of course, now I'll never be able to say "cocktail" with a straight face. Just too funny. I think you have outdone yourself with this one! Of course I would like a taste...perhaps one of these is the best way to boost a man's ego! Maybe i should find out! I snickered throughout the conversation between you and Mrs. KR. What a gorgeous cocktail! Hi Nazneen, this was so much fun to write! It really kinda wrote itself. ;-) Thanks for the comment. Hi Abbe, glad you enjoyed it! This is definitely worth a taste. Maybe you should give one of these to the Manservant after a particularly trying time of trying to outwit rabbits! Thanks for the comment. Hi Amira, isn't that so weird? The things people will try! ;-) Thanks for the comment. Hi Liz, believe me, there was plenty of snickering going on here while the post was being written! Thanks for the comment. From the minute I read the title, I couldn't wait to read your banter with Mrs. KR. You didn't disappoint! Thanks for a fun post. Hi Beth, :-) This was was too easy to write! Glad you enjoyed it. Thanks for the comment. Very interesting story behind this drink, love recipes with stories. Great drink! Yep, I bet this was waaaaaay too easy to write. You were in the flow. Oh do I love puns and word play. The title is grabber and so was the history et al. It really wouldn't matter how good the drink tastes, because just telling the history and serving it is enough. Tasting good would be an extra bennie. Hi Cheri, isn't this an interesting story? Great drink, too! Thanks for the comment. Hi Carol, this was such a fun post! Mrs K R and I had a really good time with it. ;-) Thanks for the comment. F-U-N all over the place! Great story and script :)...Best of all, a fab thirst-quencher! Hi Julie, this post was nothing but fun for us -- fun to write, and the cocktail itself is a lot of fun to drink! Thanks for the comment. Hi Kristy, the story behind this cocktail really is in the "you can't make this up" realm. And of course it lends itself to so many jokes! Thanks for the comment. What a FUN post to read. It is always refreshing to read your posts. Great drink too ! What a great photo! It looks delicious. This is probably the first drink that I felt the name of drink doesn't match with the gorgeous look on the drink.... LOL! Well, it works in a way because now I remember this name of the drink for good. :D I love how you always introduce cocktails with story, John! Hi Ansh, this is one of the more unusual drinks I know. Well, the story is, I mean. ;-) Thanks for the comment. Hi Pam, it is delish. ;-) Thanks for the comment. Hi Nami, I know what you mean about the name and look of the drink not matching. And you're right that once you know the name of this drink, you'll never forget it. ;-) Thanks for the comment. HA! I loved this story--that's a pretty high stakes naming process, dontcha think? The name doesn't make it sound spectacular, but your post sure does. Thanks for sharing! Really? Thank goodness our knowledge of human body and how it works have greatly decreased such experimental procedures. I'm sure somebody still gets a crazy idea like that nowadays, but at least we now have things called clinical trials. :) Great story John and an even better drink. I'm not surprised that you like a 2:1 gin to OJ ratio rather than 1:1. I would probably go for the same. Hi Ala, the name really does need something to be desired -- particularly after you know what it means! Good drink, though. Thanks for the comment. Hi MJ, really. One of those amazing but true things. And people believed in this procedure for several years, so it wasn't a short fad. Thanks for the comment. Hi Charlie, for quite awhile the whole world was agog over this procedure! I believe it used to be called millionaire's surgery, because only the rich could afford it. Strange story, but a good drink. ;-) Thanks for the comment. Now that's a title for a blog post. I bet everyone that clicked on your post read the article with this one! Guess whose back??? And just in time I might add. Where do you dig up these stories you two, lol...I'm sure glad I didn't miss this one, John, lol...I'll never forget that name and that story; glory be!!! You know how I feel about grenadine, however, I may just need to give this one a try just so I can say I drank a Monkey Gland. Oh wait, do I really want to say that? Heck yes! What a great post and an amazing name for a cocktail! Hi Dawn, weird, isn't it? And kind of fascinating in that car wreck kind of way. Really good drink, though. Thanks for the comment. Hi Louise, good to see you back! I'll definitely be stopping by to say hello. Glad you enjoyed this -- it's really a hoot, isn't it? Thanks for the comment. Hi Amy, this is just such a fun drink, although it's history is a bit, um, interesting. ;-) Thanks for the comment. I looked at this one and laughed and thought to myself -- nope, won't have the ingredients for sure. (We operate with a limited liquor cabinet, stocked mostly from duty free supplies on the way in to India--and you only get the standard stuff in those places). Irony of ironies, I have it all. Even the homemade grenadine. Go figure! Monkey gland is to be mine. Ha ha! This drink has a really weird name but it looks beautiful -- like sunset! Hi Deepa, most people don't have everything on hand this cocktail requires -- I'm impressed you do! And homemade grenadine is a refrigerator staple, isn't it? ;-) Thanks for the comment. Hi Peachy, the name and the history of this drink is definitely weird. But the drink itself? Wonderful! Thanks for the comment. Hi Kristi, isn't this cocktail's moniker so strange? But the drink is great! Thanks for the comment. What a beautiful drink with such a strange story to it. I had no idea surgeons had such strange notions in the 20s. That is so recent for such idiotic notions. I guess the only good think to come out of it was the drink. Hi Suzanne, the story behind this drink really is strange. Fun drink, though. Thanks for the comment. wow! cool cocktail! we have everything but the absinthe, just need to get it to try it out! interesting story behind the name! Hi Sarah & Arkadi, it really is an interesting story. And absinthe has such a nice flavor -- and loads of drinks use just a little bit as "spice," so it's worth investing in at least a small bottle. Thanks for the comment. Hi Greg, I'll bet it was a lot more than 5! ;-) This is such a rich target, isn't it? I do love gin, I must admit, although we have loads of rum drinks coming up. Thanks for the comment. So beautiful John! 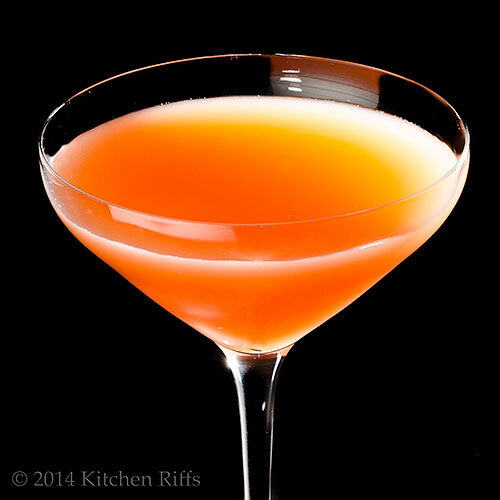 You should write a cocktail book - you really have a way with drinks. This sounds awesome - another one I never heard of until this post! Hi Alyssa, isn't this pretty? And so tasty! Thanks for the comment. I like the story about the doctor, sounds like he was a little crazy to me. The drink sounds nice and refreshing. Love the color of it. Hi Dawn, definitely a little crazy! The drink isn't crazy at all, though -- quite nice, actually. Thanks for the comment. Hi Bam, this drink does have a bit of booze in it, but you could make the two part gin one ounce, thus the 1 part OJ would be 1/2 ounce -- not to bad. Just reduce the grenadine and absinthe accordingly. And if they had twitter back then? The world would have been even more agog about monkey glands! Thanks for the comment. Love that this is called monkey gland, I think I have most of those ingredients in the house! Hi Caroline, isn't this name so interesting! Great tasting drink -- and you have the ingredients on hand! ;-) Thanks for the comment. Hahaha, too funny! But I'll admit the image of the grafting did make me turn a bit green.. time for a good stiff cocktail, that'd be the cure! Hi Barbara, that grafting bit is rather disturbing, isn't it? But a good stiff drink is the cure for loads of things! ;-) Thanks for the comment. Ha-ha! I couldn't stop laughing at the name of this cocktail, and your post was even funnier! Lovely color this drink has! Very vibrant! Hi Julia, glad you enjoyed the post! And I agree the color of this drink is sooo pretty. Thanks for the comment. Hi Uru, isn't this a fun drink? Love its name! Thanks for the comment. Hi John, interesting story! New to me, and I've read a lot about this drink. Do you have a source where I could read more? Certainly the drink evolved as I've described it, and probably for good reason. First, way too fiddly for a bartender to garnish a popular drink that way (and this was quite the rage for a time). Just took too much time, I'd think. And second, the idea of a cherry garnish just jars -- the flavor is wrong for the drink, IMO. But you paint an intriguing picture. Thanks for the comment.